In the midst of your pregnancy, you’ve had the baby-shower, painted the nursery, purchased baby clothing, and you have prepared yourself mentally for the untold sleepless nights ahead of you as new parents. However, estate planning may not be on your list of priorities. You may not even fully understand what estate planning is. That’s okay! At McDonald Law Firm, we’re here to guide you through the key considerations of estate planning for parents, including guardianship, college savings plans, life insurance, and more. If you have questions that are not answered below, simply give us a call at 443-741-1088 to schedule a consultation. If you need a little help defining these key terms and concepts, or could simply use a refresher, please click here. Otherwise, read on to learn more about some of the most frequently asked questions relating to estate planning for parents and young families. 1. How important is estate planning for parents? Do I really need an estate plan? Yes! While new parents may not think they need an estate plan, this could not be further from the truth. All parents of minor children should have a properly executed estate plan. An estate plan does more than just determine what happens to your assets upon your death; proper estate planning for parents also outlines what happens to your children. In fact, one of the most important aspects of estate planning for parents (and often the catalyst for getting new parents to contact an estate planning attorney) is the ability to nominate a guardian for your minor children. 2. Should I name a legal guardian for my minor children? Yes! While most parents plan for their children financial future, most fail to plan for their children’s future in the event both parents are deceased. None of us likes to consider our mortality, but being a parent naturally makes you think about the future. When you have kids, their security is your prime concern. And as important as it is to consider finances for your child’s future, designating a guardian – in the event that you should you ever become incapacitated – is even more critical. 3. What is a guardian? A guardian is a person who has legal responsibility for a child in lieu of the parents. Guardians are appointed for children when the parents are deceased, or if they are abandon children, or are unable to care for them. In a guardianship proceeding for a minor child after the death of both parents, a Maryland court will always first look to the desire of the parents as expressed in their Wills. Under Maryland law, a Circuit Court, in the County where the child resides, must appoint as Guardian the person nominated to serve as Guardian in the Will of the mother or father of the child unless the appointment of the nominated individual would not be in the best interest of the child. 4. What factors should be considered when choosing a guardian for your child? Is the individual willing to serve as guardian of your children? Does the individual have the maturity and stability to parent your children? Does the individual share the same family and religious values as you? If your children are home schooled, can the individual continue to home school your kids? Is the individual values and financial lifestyle comparable to yours? Is the individual willing to devote the time and energy necessary to raising your children? Does the individual have a health condition which would prevent s/he from raising your children? Does the individual know, like, or love your children? Will they love your children and provide the support, comfort and nurture that your children will need? Does the individual have a home with adequate room to accommodate your children, or will they need extra funds to allow them to add on or buy a larger house? Will they make it possible for your children to visit grandparents or other relatives or close family friends? Does the individual have an abusive or substance abuse history? Can the individual take care of a special needs child, if your child is a special needs child? 4. Do I need to establish a Special Needs Trust for the benefit of my special needs child? Yes! If your child is a special needs child and s/he is receiving federal or state government means-test benefits, such as Medicaid or Supplement Security Income, you should consider establishing a Third-Party Special Needs Trust to hold assets for your special needs child. A Third-Party Special Needs Trust is a trust created by using the assets of a third party for the benefit of a disable child or adult. The assets held in the trust are not counted as available resources in the calculation of government need-base benefits. Assets remaining in the trust after the death of the special need child are not subject to a payback requirement. 5. Do I need a 529 College Savings Plan for my child? Yes! A 529 Plan is an education savings plan operated by a state or educational institution designed to help families set aside funds for future college costs. It is named after Section 529 of the Internal Revenue Code. (Under the Tax Cut and Jobs Act, passed and signed into law in December 2017, funds from a 529 plan can now be used to pay for private elementary and secondary schools education). The account owner, not the beneficiary, controls the account and makes all the investment decisions. But if the beneficiary, your child, decides not to attend college, the owner can change the beneficiary to another member of the family. Parents, Grandparents, family friends, or anyone can contribute to a 529 plan, regardless of income. Contribution limits depend on the state’s plan. In Maryland, a 529 plan can continue to accept contributions until the account balance for the same beneficiary reaches $350,000. The federal gift tax exclusion allows a contributor to give up to $15,000 per year (in 2018) per beneficiary, or $30,000 (in 2018) if you’re giving as a married couple. You could also choose to give up to five years of gifts in one year, and that amount is removed from your estate. However, if an electing contributor dies during the 5-year period subsequent to the contribution, amounts of the contributions allocable to years after death are includible in the contributor’s gross estate. Moreover, regardless whether the 529 plan was set up in Maryland or another state, the distributions of monies from the plan can be used at an eligible educational institution in any state. “Eligible educational institutions” are any accredited college or university that offer classes toward a bachelor’s, associate’s, graduate or professional degree. Some states provide tax incentives to residents who invest in their home state’s 529 plan. Maryland residents who establish a Maryland 529 College Plan are eligible for a tax deduction. For example, Contributions to the Maryland College Investment Plan of up to $2,500 per beneficiary per year by an individual, and up to $5,000 per beneficiary per year by married taxpayers are deductible in computing Maryland taxable income, with a 10-year carryforward of excess contributions. Account owners and contributors are eligible for the deduction. Rollover contributions are deductible if not previously deducted. Distributions used for nonqualified educational expenses are subject to ordinary income tax plus a 10% penalty on the earnings. 6. Do I need a Last Will and Testament? Yes! The Will is the foundational document of your estate plan. Through the Will, you can leave gifts to specific family members or charitable institutions and create a lasting legacy. A Will is also important to name a guardian for your minor children and to appoint an executor to carry out the terms of the Will and distribute your estate according to your wishes. 7. Do I need a Revocable Living Trust? Maybe! If your goal is to avoid probate, a revocable living trust is one estate planning vehicle used to avoid probate. A revocable living trust is an excellent vehicle for transferring assets, including cash and property, to your spouse, children or others. Assets placed in trust do not have to go through probate, meaning that they can be distributed to beneficiaries more quickly and with less expense than through a Will. The terms of a trust can also be kept confidential, as opposed to a Will, which becomes a matter of public record when it is probated. 8. Do I need a Pour-Over Will? Maybe! A pour-over will is a last will and testament that serves as a safety device to capture any assets that are not transferred to or included in a revocable living trust. An important part of creating a living trust is that it needs to be “funded,” meaning that your personal assets must be transferred into the revocable living trust and/or retitling the assets in to the trust’s name. While “funding” a living trust can be an easy process, sometimes assets don’t always make it to the trust for a variety of reasons. 9. Do I need a Power of Attorney? Yes! You never know when something may happen (injury or illness) that renders you incapacitated and unable to care for yourself or manage your financial affairs, whether only temporarily or for the long-term. Your spouse, friends, or family cannot act on your behalf in relation to assets or property solely held in your name. However, by preparing powers of attorney in advance, you can choose someone you know and trust, such as your spouse, to make financial or legal decisions on your behalf during any period of incapacity. Otherwise, a court may decide these issues for you, or appoint some stranger or institution to manage your affairs. 10. Can my spouse, friends, or family members make healthcare decision for me without a Healthcare Power of Attorney? 11. Do I need a Living Will even though I am married? Yes! Spouses, friends, or family cannot make a decision whether to remove or withdraw life-sustaining medical treatment from you without having a living will designating the spouse, friend, or family member as a patient advocate. If there is no living will in place, a court order authorizing the removal of life-sustaining medical treatment is required. A living will, sometimes called an advance directive, is a legal document that provides instructions regarding the medical care a person wishes to receive if he or she becomes incapacitated or seriously ill and cannot communicate their preferences themselves. The details of living wills often include considerations such as whether the person would like life-sustaining medical treatments or feeding and breathing tubes to be used. A patient advocate is named in a living will (advance directive) to represent the interests of the living will’s owner. Through a patient advocate, this agent communicates with doctors and other medical personnel regarding the person’s desires, as expressed in the living will. Protecting children’s inheritance in the event of a surviving spouse’s remarriage. Now that you have considered these issues and for expedient we shall look at probate. 12. Can I avoid Probate? Yes! But first, what is probate? Probate refers to the process whereby certain of decedent’s debts may be settled and legal title to the decedent’s property held in the decedent’s name solely and not otherwise distributed via beneficiary designation, or operation of law is transferred to heirs and beneficiaries. 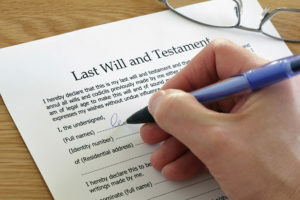 If a decedent had a will, and the decedent had property subject to probate, the probate process begins when the executor, who is nominated by the decedent in the last will and testament, presents the will for probate to the Register of Wills in the County where the decedent lived, or owned property. (For example, if s/he lived in Columbia, Maryland, the will must be presented to Office of the Register of Wills in Howard County.) If there is no will, an interested person (surviving spouse, child, parent, etc.) must petition the Register of Wills to appoint him or her as personal representative of the decedent’s intestate estate. Once appointed by the Register of Wills, the personal representative becomes the legal representative of the estate. Now, how can I avoid probate? They are several mechanisms that can be employed to avoid probate. First, title to property can be held jointly by husband and wife, thereby, vesting title to said property (real and personal property) to the surviving spouse upon the death of the other spouse. Second, beneficiary designations can be used to designate which spouse title to property goes to upon the death of the other spouse. Finally, property can be held in a trust, revocable or irrevocable, thereby vesting title to said property in the name of the trustee and successor trustee of a trust. Okay! You have considered the preliminary issues now it time to determine what type of estate plan best fits your family’s needs. 13. Is a trust base estate plan right for your family? Like so many legal questions, the answer to this question is, it depends. If one of your main goals in putting your estate plan together is to “avoid probate,” the answer to whether a trust base estate plan is right for your family is YES! A trust base estate plan would be right for your family under this scenario because all of your real and/or personal property that are transferred and/or retitled in the name of the trust will not pass through the probate process, before they are distributed to your beneficiaries, upon your death. Instead, your trustee, the person appointed by you to administer your trust upon your death will administer the trust according to its terms. 14. Is a Will base estate plan right for you? Using the same scenario as above, if one of your mail goal in putting your estate plan together is to “avoid probate,” the answer to whether a will base estate plan is right for your family is NO! A Will base estate plan would not be right for your family in this scenario because a Will must be probated, meaning the Will must be accepted as a valid document by the Register of Will and properly administered, in order for assets to be distributed to beneficiaries of the decedent’s estate. 15. Do I need life insurance as part of my estate plan? Yes! At McDonald Law Firm, we believe that new parents should have life insurance as part of their estate plan. When it comes to estate planning for parents, life insurance is one of the most common and effective ways to ensure loved ones are financially taken care of after your death. For instance, a life insurance policy can guarantee financial resources to a surviving spouse upon the death of the other spouse, it can also guarantee the resources to pay for the college education of any children. A huge benefit of life insurance for estate planning is that it typically will not be subject to an estate tax and/or income tax. If you have additional questions about estate planning for parents, or are ready to get started, please give McDonald Law Firm a call today at 443-741-1088 to schedule a consultation. Our office is conveniently located in Columbia, Maryland between the Columbia Mall and Merriweather Post Pavillion. For office directions, please click here. DISCLAIMER: THE INFORMATION PROVIDED IN THIS GUIDE IS INTENDED FOR EDUCATIONAL PURPOSES ONLY AND IS NOT INTENDED TO CONVEY LEGAL OR TAX ADVICE.